UPDATE: TEN IS NOW AVAILABLE FOR YOUR EYES AND EARS! As a young child in the 80s, I was pretty obsessed with horror, sci-fi, and just plain strange films. At first, it was the Universal Monsters, then it was A Nightmare on Elm Street and House, my first R-rated movies, viewed nervously from the corner of the room through my fingers at retrospectively surreal 5th grade spin-the-bottle parties. By junior high and early high school, I was tearing through every strange title I could find at one of my local video-rental stores with my friend Josh for our frequent four-movie-day marathons or thumbing through the TV guide listings for Cinemax and Showtime’s overnight slots. Long story short, I loved movies that took a chance. I loved movies that told a unique, strange, personal story to a niche audience. Whether it was compelling, surrealist horror like Phantasm or ridiculous tongue-in-cheek gibberish like Blood Diner, I consumed and loved it all. 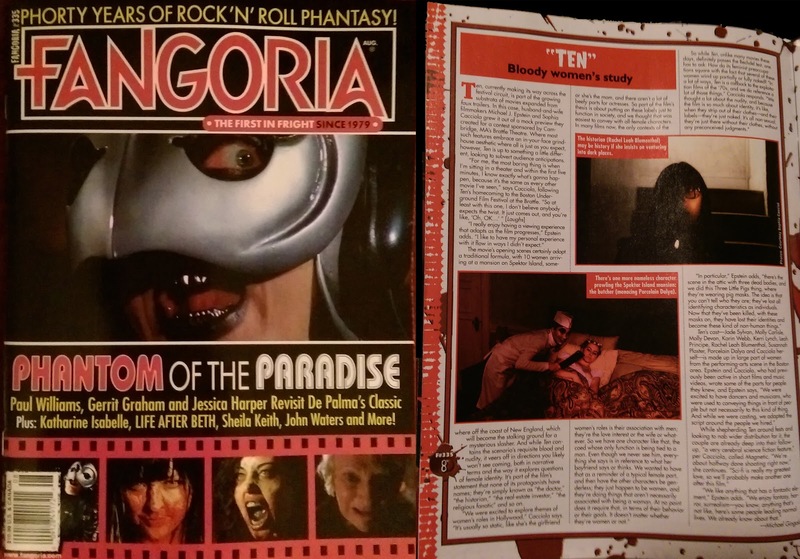 And when I wanted to learn more about my favorite popular (or obscure films), Fangoria was the top choice on the magazine rack, with everything from previews of upcoming weirdness to behind-the-scenes looks at the practical effects creating the wonderful gross-out momennts in my favorite movies. Undoubtedly, Fangoria fed my curiosity about how these movies got made and sparked an interest in making them myself! My love of genre film has continued (though I favor the classics of my youth over more modern fare) and when it became feasible to create something of my own, I went back to everything I had learned from my study of not only film itself, but the commentary and insights of Fangoria and its cousins. Issue 335 of Fangoria is out! It includes our full-page feature interview about TEN, with a focus on the underlying themes and the film’s exploration of female identity. We are deeply honored to be included in the magazine, and to have something in life come full circle in this way is a wonderful and rare moment that I will appreciate and cherish. Buy a copy in the Fangoria store and help keep Fangoria telling the stories of people like us, and putting those stories in print right next to the big guys.